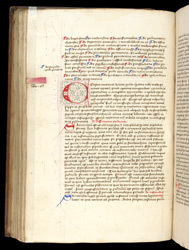 The enduring late medieval textbook 'Compendium of Theological Truth' ('Compendium Theologicae Veritatis') has been attributed to an unusually large number of authors, including Thomas Aquinas, but recent studies conclude that Hugh of Strasburg wrote it in the 2nd half of the 13th century. It presented in a practical arrangement discussions of a wide range of topics. This copy belonged to the Franciscan convent at Worcester. This page has the list of chapter titles and the beginning of the section, one of seven in the book, on the sacraments. In the list written across the top of the page on several lines, each title is separated by a red or blue symbol. Farther down the page the section itself begins with a large, decorated first letter of the words in Latin, "The heavenly healer".